To provide an exceptional healthcare experience. To always be a progressive healthcare system that is a benchmark for all others. Leigh Faaborg, Marc Legge, and Ashley Recknor of Wright Health Partners were interviewed by the Network TA team to share information on the network’s characteristics, key learnings, accomplishments, and challenges. 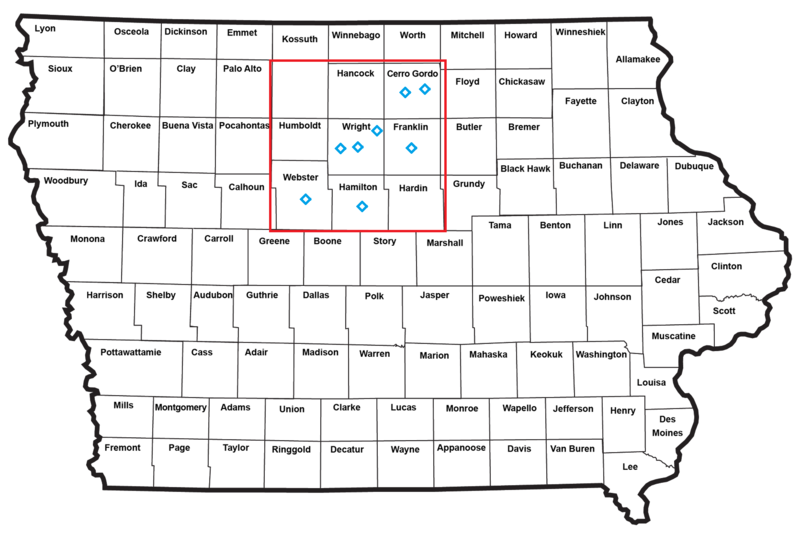 A: We are a rural consortium consisting of nine members in northcentral Iowa. Our membership is quite diverse, and as such brings many different perspectives and experiences to the table. We work to address health issues in our rural area. The network initially formed when two critical access hospitals came together under a management agreement. Then in 2007, the Orthopedic Specialists group out of Fort Dodge began performing surgeries here in Clarion. Then the Gabrielson Clinic for Women decided to have their main practice out of the Clarion hospital as well. Back in 2010, some of us were on different electronic medical records, and some of us were still on paper. We applied for a grant that would support our transition onto one EMR system and really made that leap, and that's when the memorandum of understanding and Wright Health Partners was formed. We've grown from there, bringing on the schools, the ambulance service, and other partners from the community. A: Initially, our network was put together to bring in funding and further the goals of the area, and we've been pretty successful in that. That funding has flowed through and helped us build programs that continue to directly and indirectly benefit our members, whether it's our care coordination or allied health. These endeavors also help connect us to nonmonetary resources, like technical assistance, that are tremendously helpful to our members and really help us navigate the changing health landscape. Another benefit of being a member of our network is the opportunity to network with other people in the community. Sometimes our members work maybe two or three blocks away from one another and still never see each other outside of our network meetings. The opportunity to meet with like-minded individuals and combine resources is an important benefit. Especially in rural Iowa, where resources are scarce, it allows our network members to get the most bang for their buck. We’ve continued to build upon our work with the shared EMR service for our network members who are health care providers. Having that shared chart for our large service area, whether it’s in a private OB/GYN practice, a private orthopedic practice, or a critical access hospital, is really a benefit as well. A: We're looking toward the future of how we can expand with other partners, which really expands the benefits that we can offer when you see how many different ways we can work together. As we've partnered with the schools, we’ve seen a ton of different opportunities brought up at meetings. We’d like to partner more with the police department and the fire department. One of our main projects is care coordination. A lot of times, police may get called to help someone up off the floor from a fall or to help with a minor cut, for instance, which would be useful information to the hospital or the long-term care facility as patients come in. We’re going to try and tie them in to really help us provide a more unified approach to community care. We also talked about partnering more with dentistry offices and public health. Right now, public health is not one of our official network members, but we do collaborate with them fairly often on some of our grants. They're a big supporter, and bringing them in officially would be a great opportunity for us. A: The biggest challenge for us is the same challenge facing every rural network at the moment: our population is statistically poor, older, and sicker. That means we have a lot more to deal with per capita and per organization. Along with that, one of our challenges is getting paid through insurance in the changing health care landscape. That's something that drives us, as a network, to find efficiencies and work to reduce costs. It can also be a challenge to keep the network a priority for every member. It’s important to have a champion for each individual project. You have to have someone shepherding and taking care of the project, or else it goes on the back burner. We also try to recognize that some members are more engaged with some projects than others. It’s key to have that one person who makes sure a project keeps moving and keeps working toward the goals of the overall group, but then engaging the correct partner with the correct projects. A: The sense of community and the willingness to work together is something that you wouldn't necessarily see in our large urban competitors. Our network includes business competitors who are working together because they recognize the common interest in a healthier community. Even if you look at our Allied Health Training project funded through a HRSA grant, all of our partners are competing for the same workforce. Rather than each one having its own individual program, they decided to work together. We wound up with a nice strong program that's developed the next generation of health care workers, and then we can line them up with employers right off the bat. Our network of resources is another advantage. It's a smaller community in a rural area. It’s easier to reach out and include others as we go, just because our networks are maybe a little bit broader in these areas where we know more people and have easier access to some of those other organizations. Being in rural areas, we always hear the phrase, “Everyone wears a bunch of different hats.” Because of that, everyone has a wealth of knowledge. It's not one person who’s a master at their trade and that's all they know. Everyone has at least a fairly broad expanse of knowledge to bring to the table and to help the network grow. Even if you might not have large team, you'll still have people who are good at their jobs and able to make the connections. A: Traveling to different conferences and talking to other networks around the nation, it’s surprising to see how consistent and universal problems are. Everyone is trying to find health care workers. Everyone's dealing with the finance issues. Everyone's dealing with the changing health care landscape. As we talk to people from Arizona or Alabama or Oregon or wherever from around the country, it's a lot of the same issues and a lot of the same solutions. We may have to go about it slightly differently based on our community or target population, but we've been able to apply a lot of things we've learned from other networks. Q: Tell me about a difficult situation your network has recently faced. How are you working to overcome it? A: We applied for a grant to tie our ambulance services together into a county-wide service. We were going to try and consolidate them, but there are quite a few logistical issues that cost a not-insignificant amount of money to address. We ended up not getting the grant funding, which put up a big roadblock for us. As a network and as members of the network, we definitely had to change our plans, but we’re still moving ahead on that project despite this. We determined it wasn’t something we could wait on. It’s very much a loss-leader service in our area, especially having multiple municipalities and then public hospitals involved. We need to remove the inefficiencies and really start working toward a more unified service. The CEO for our hospital has been active in working with our members and working with other agencies around the county to keep that project moving forward despite the lack of funding. A: Tap into other rural health networks. There are networks that have been around for over 30 years now, and they might have thought up solutions 20 years ago to the problems that we're facing now. We made a couple of mistakes along the way and learned from them, and if we can help someone in the future avoid those same mistakes and have a more streamlined process, we'd be happy to help them. That’s been true of any network we’ve talked to. Everyone's willing to assist everyone around the country. Even if you don't have grant funding available to you, utilize those free tools that are out there if you're starting a similar program. Joining the National Cooperative of Health Networks, NCHN, has been very beneficial. It’s also really beneficial to get all of your members around the table to talk about the mission and the vision. It’s educational to listen to what other people envision for the network, and it gets everybody on the same page for the formal planning process as we move forward. We have been a fairly informal network, and now we're trying to become more formalized, more structured. Don’t be afraid if you aren't a super formal, structured network in the beginning. It takes time, and it's something that you grow and mature into over time.